We want to provide a continuing display of particularly rare plates. Collectors will undoubtedly know which items in their collection fall into this category and should they have any nice photos of any such items that they wish to share with others, we shall be pleased to hear from you. Experienced collectors feel that the earliest plates are those made of flat metal plate in brass or iron. 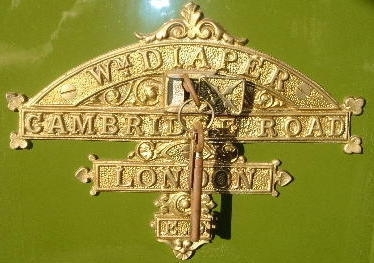 These are inscribed with the maker's details within fancy decoration. Even if you do not collect safe plates they provide early important information adding knowledge for all. 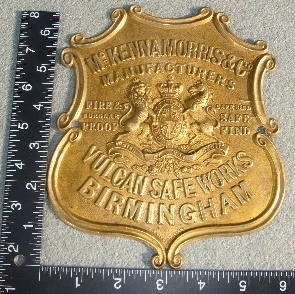 The upper photo above provides information about a little known maker, McKenna Morris & Co having their factory in Birmingham. This fine decorative plate is probably Victorian. The lower photo above is J. 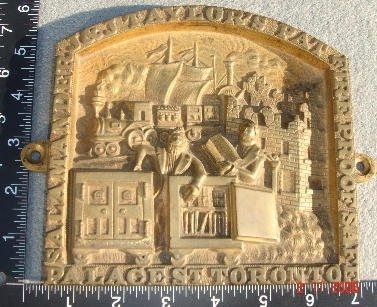 & J. Taylor's plate of Palace Street, Toronto. It is in the style of early American (c.1850s) plates with a three-dimensional view. Canadian plates like this are rarely seen. Two interesting plates with similar styles and addresses. Did William Diaper succeed James Dix, or the other way around? 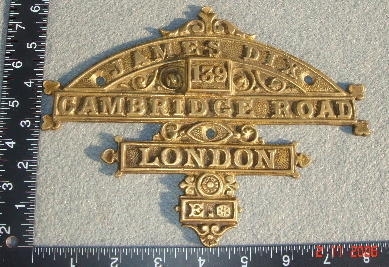 Another plate issued by Dix shows his address at "139 & 141 Cambridge Road Works, Devonshire Street, London. E.; a 'Safe Engineer' who he said was "27 years with the genuine John Tann". These two might perhaps date to around 1900 and are not commonly seen.